Remember when you had to use ropes to tie bikes on your car or look tirelessly for a foldable bike to easy transportation? Seems like ages ago! Today, bike racks have come to the rescue. Every bicycle owner with a vehicle will find the use of this equipment convenient. It goes without saying that you cannot just buy any rack you come across. It is for this reason that this intense articles on the best bike racks in the market was written. Let’s break in down on each aspect you need to be knowledgeable about before purchasing a rack for your tandem. What are bike racks used for? Any advice on where to buy bike racks? Which bike rack is best for my car? Can bike racks be stolen? Which trunk bike rack is best in the market? I want to know how to install bike rack on my vehicle. How do I go about it? 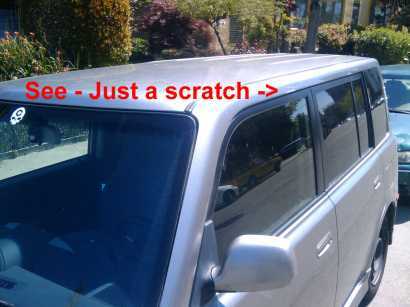 Will bike rack scratch car paint off? What are the ways on how to lock bike rack to car? Does where to put bike rack matter? How do I attach bike rack to car? The kind of vehicle you rove around in is a key determinant in the kind of mount you purchase for your bike. Below are common vehicle types with respective racks for each. Transporting two bikes on your SUV has never been easier than when using a Saris Bones 2-Bike Rack . It is a durable bike rack made from 100% recyclable material that cannot rust. It is also very easy to install and has a stylish design. 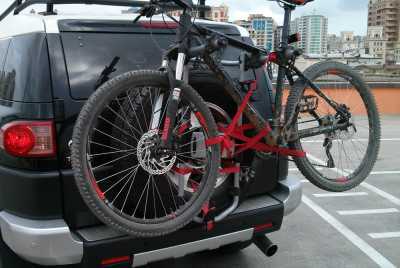 If your car has a hitch mount, then go for Thule T2 Pro XT 2-Bike Rack, another one of the best bike racks for SUVs. It protects the paint on your bike and SUV from scratch and does not obstruct you from accessing the rear of your car as most hitch mount racks would. Do you have crossbars on top of your car? Yakima Frontloader Rooftop Bike Rack is a fully assembled rack that is easy to install and fits on nearly all crossbars. There shall also be no contact between your bike frame and the car. We also found Allen Sports Deluxe Trunk-Mounted Bike Rack from our list of top bike racks for cars to be a wise choice for you. 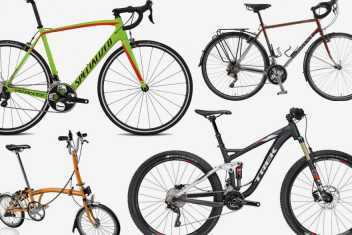 It is very affordable and comes in versatile models that can fit 2, 3 and 4 bikes – your pick! The stable grip it has on bikes makes it stand out. You can go biking with your family without worrying about how to move about with them. 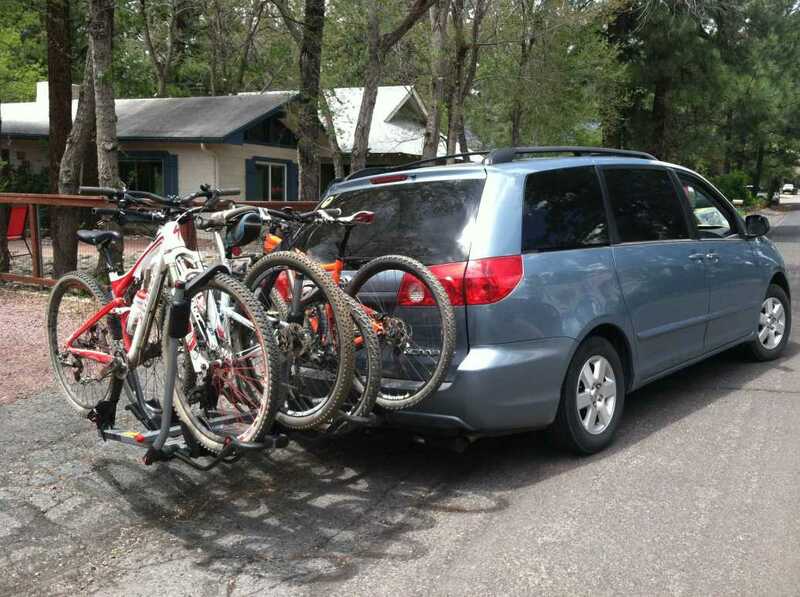 Graber Guardian 3-Bike Trunk Rack is one of the finest minivan bike racks that fits perfectly on minivans and has a firm grip onto the vehicle when you install it. The ease with which you shall mount your bike makes it worth purchasing. Do you want a relatively cheaper option? Overdrive Sports 3-Bike Trunk Mounted Rack is what you need. It comes preassembled, making the installation process smooth. It is also versatile and lasts for long. Are you in for a weekend getaway with your best friends? Well, you could really use a Surco 501 BR Ladder Mounted Bike Rack. It is inexpensive and can accommodate 2 bikes at a go, with no restrictions on their weights. 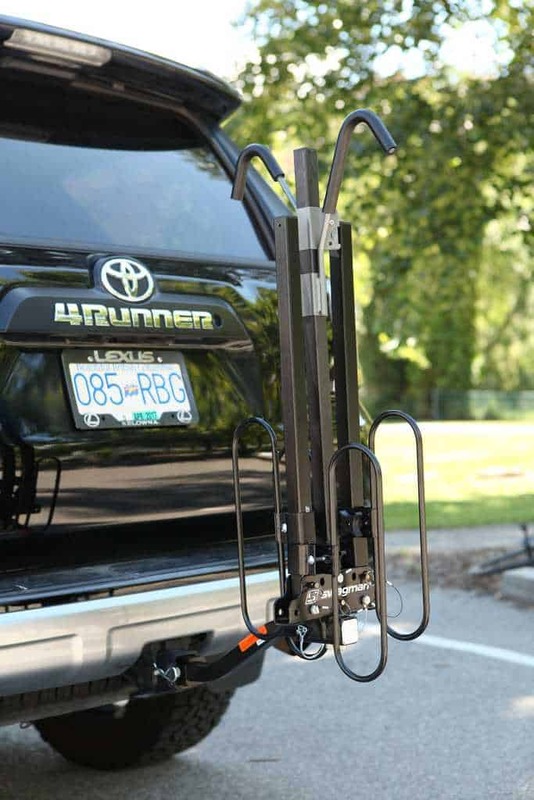 You can also check out Swagman RV Approved 2-Bike Bumper Rack , one of the best RV bike racks. As the name suggests, is mounted on the bumper. It supports bikes of several sizes, frames and wheels and it is very easy to use. Let the old habit of tying your bike on the truck bed using funny straps die. Catch a break with Heininger Automotive 2025 Advantage Sportsrack Bedrack , which accommodates up to 4 bikes without removing the front wheels. It can also be used as a standalone bike rack when you uninstall it from the truck. A Swagman Adjustable Truck Bed Bike Rack is another great option from top truck bed bike racks in the market. The rack accommodates two cycles and has them well spaced so that they are not in contact with each other. You can adjust it to fit on various truck sizes. It is also important that you know the most appropriate type of rack before you can settle for one. There, are five common types, so you will definitely be spoilt for choice. Does your vehicle have a hitch receiver? You may find Hollywood Racks HRI400 Sport-Rider the most secure rack for your bikes. It can hold up to 4 bikes of various sizes and can be folded against the car when not in use. Swagman XC Cross-Country 2-Bike Hitch Mount Rack also came up in our list of top hitch mount racks in the market. It gives you easy access the trunk, is easy to carry and transport, and protects your car’s paint and bike’s coating from scratch and abrasion. Trunk racks are suitable for cars with neither a hitch receiver nor a spare tire on the back of the car. A good example of a truck rack is the Kuat Racks Sherpa Trunk Bike Rack (ASIN B01MQ60435). It is adjustable, secure and can hold up to two bikes. A cheaper option in our list of best trunk mount bike racks is the Tyger Auto TG-RK18102B Deluxe Trunk Mount Rack. It comes fully preassembled, has foldable carry arms and strong enough to accommodate one tandem. 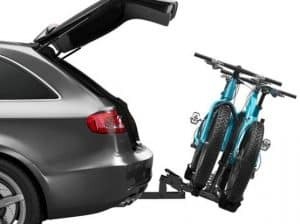 You should totally buy the best roof bike racks if you want space for other cargo on your car roof and do not want to obstruct your rear view. Yakima Highroad Top Car Bike Rack is easy to install and grips your bike so firmly that it cannot sway or fall. It is a rack that can be converted into a flat-slot crossbar attachment. You can also try out the Thule Sidearm Roof Rack. It is made of no-corrosive material and ensures no contact between your cycle frame and the vehicle. You should see how firmly the rear wheel gets gripped on by this rack. A spare tire rack comes in handy when you want to ensure absolute protection of the car and bike paint, and need a smooth installation process onto the spare tire. Among the best spare tire racks in our list is the Yakima SpareRide 2-Bike Carrier Rack. It gives your cycle premium protection. It is also strong, durable and easy to install. Allen Sports Deluxe 3-Bike Spare Tire Mount is also great if you are on a tight budget. It is designed to protect the finish on the bike as there is no contact between the vehicle and the bike. The rack is easy to install as well. This type is for you if you own a truck with hitches. We found the Sunlite QR Bike Block Fork Mount from our list of the finest fork mount bike racks to be a good place for you to start. It is easy to transport and store. Do you want to install it vertically or horizontally? Totally your choice! A more affordable option is the EVO Quick Release Fork Mount. You can buy it a fair price, and take a very short time in the installation stage. The mount is easy to store and transport as well. It matters to know the type of bike you move around with. The size of the tire, wheel and frame has everything to do with the bike rack you will purchase. These are sturdy bikes with carbon fiber frames, and they definitely need the right racks for high maintenance. Thule T2 Pro Bike Rack ensures no frame contact with your vehicle. Its hitch lever twists up when not in use, and down when you want to access the car rear. Yakima Dr. Tray 2-Bike Rack is another one of the best carbon fiber bike racks that hitches any tire size. It offers your two tandems great spacing so that they do not touch each other, is lightweight and easy to use. It is not a hustle transporting fat tire bikes anymore. With a Rocky Mounts Backstage Swing Away Platform Hitch Rack, you can transport any fat bike or mountain bike you desire to. It is a hitch mount rack that gives you easy access to the rear of the car by simply swinging it to the side. A Kuat Transfer 2-Bike Platform Rack is suitable for travel. You mount it on the hitch of your vehicle and fold it up when not in use. 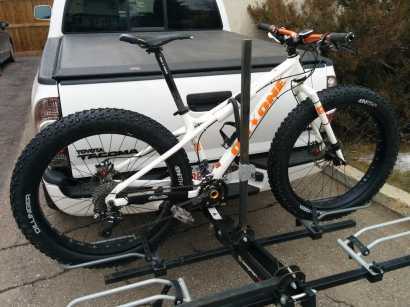 It is among the best fat tire bike racks for you if you want to move around with two bikes mounted safely on the hitch. In the past, it was tedious finding the best bike rack for full suspension mountain bikes. The story changed with Yakima High-Speed Top-Car Bike Rack , a rack with a sleek, stylish tray that fits securely on most crossbars. Saris SuperClamp EX-2 Bike Rack is also very functional, lightweight and secure. You can tilt it down when not in use, and up when you want to access the rear of your care. It is a dope thing that the rack comes with a lifetime warranty. It is settled; you need a bike rack. What you cannot do is go shopping blindly. Unguided purchase of bike racks will leave you with a wrong purchase, one that you will bite your lips with out of regret. Consider important factors like various bike sizes, type of car you own and the tandem you cycle. You should own a rack that fits your personal requirements as well, like the ease of installation, weight and trunk accessibility. Below are some of the key considerations to take into account before purchasing a bike rack. It is unreasonable purchasing a hitch mounted rack when your vehicle does not have a hitch receiver. Do you want to remove the front wheel of your tandem? If no, then why buy a fork mount rack? Such insights and questions should be the guide to use before settling for a bike rack. Know all that you can about types of bike racks and consult your retailer on the topic before cashing out. Do you like biking alone or you are more of the groupie type? There are bike racks suitable for transporting just one bike, which is the case with most roof racks. There also some that accommodate two bikes only, leaving you with ample space for other cargo. If most times you move around with your bikes it involves friends and family, go for racks with the capacity to hold between 3 and six cycles. It is important that you be realistic in the number of bikes you actually transport, not mere aspirations. 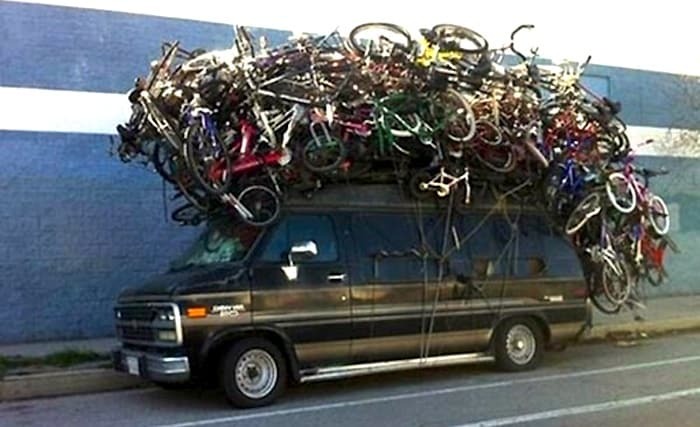 If not sure, opt for those that can use extenders to hold more bikes when the number increases. An RV bike rack is different from a truck rack, and so is one for the SUVs. Be sure about the type of vehicle you drive before you can go mount shopping. From our review, there are racks suitable for different cars. How unfortunate it shall be for you if you purchased a rack suitable for minivans and install it on a truck. It will have you badmouthing the rack for no good reasons. How often do you plan to use these racks? There are bike racks that once mounted on the vehicle; you will be comfortable leaving them there for some time. If you are a frequent biker who loves moving around with their cycle on the car, these are the types for you. If however, you do it once in a while, say on a monthly or fortnightly basis, buy one that is easy to install and uninstall. The storage mechanism should also be easy and portability. For this case, fork mounts and trunk bike racks will do. The price at which these bike mounts are sold at varies depending on the reputation of manufacturing companies, material & technology used in construction, the number of bikes transported, name it. It is up to you to choose one within your budget. For each expensive bike rack you encounter, there is a cheaper option. However, do not let this be your key determinant in making the purchase. The equipment serves you a long time after, so it is worth spending a little extra on it. Your usability should guide you on this; is it cheaper buying one or hiring it? If you intend to install the rack and uninstall it often, it is advisable that you buy one that will not waste your time and energy on the process each time. It is important to note that most of the equipment on sale is easy to install, and they come with instruction manuals. If it gets too tough, consult experts and YouTube videos. You should also consider how much help you will get. Roof racks, for instance, need you to have enough muscle to left them and install, then lift the bike up. Can you handle it, and if not, do you have people to help you out? Different cycles have different wheel, tire and frame sizes. For this reason, the racks constructed are there to suit a given range of measurement. Have the sizes and type of bike you have in mind when going shopping. Note that some of these racks are adjustable to fit any size, so you can buy those whenever you feel unsure about your bike measurements and type. Do you need to access the truck bed or the car trunk often? How easily can you do this with the bikes on board? There are bike racks that make the process easy with the enhancements of levers that can be tilted to allow you to access the trunk. You can also get yourself racks that do not use the trunk or truck bed instead, like the roof racks. If you are always having luggage with you, buy a mount that has nothing to do with the accessibility or space of your cargo. All bike racks are there to give your cycle a firm grip so that it does not fall. It is important that you know how to secure the rack and bike is from thieves. There are those that come with a fully integrated security system, so you will be sorted on this part. For those without an inbuilt security system, buy them and buy locking systems like cable lock and locks. This way, you will protect your belonging and not have to move around worried that something could suddenly go missing. Bike racks are used to hold a bicycle at a stationary position. You can have a bike rack on your vehicle or one in the garage. When installed on vehicles, bike racks are used in the safe transportation of one or more bikes from one place to another. Absolutely! you have the option of going to either of the following three places to purchase the best bike racks in the market. Allen Sports Deluxe Trunk-Mounted Bike Rack is the best for your car. It comes in three different models with different bike capacities, has a stable grip on your bike and it is easy to install. Best of all, it is very affordable. Yes, they can. Bike racks with no integrated lock systems are exposed to the risk of theft. It is advisable that you purchase your own lock system in the form of locks and cable locks to nullify the chance of the rack being stolen. Tyger Auto TG-RK18102B Deluxe Trunk Mount Rack, which holds one bike only, stands out among others. It is one that comes preassembled by the manufacturers, is easy to install and a sturdy model. It also has fold able arms, hence the best trunk bike rack so far. All types of bike racks have a unique way of installing on the different types of vehicles. In most cases, the process is tool free, and there is an instruction manual with each purchase. Follow all steps correctly because it is a DIY process. When the going gets tough, consider watching YouTube videos or going to a professional for the service. It is simple and you will be fine. No, but that all depends on how you install the rack. Most of these racks are designed to avoid any contact between the bike and the car, yet still grip your bike firmly without scratching paint off. It you do not install it right and leave it loosely attached, the rack will keep moving and scratching your car. The trick is in then installation stage. Some bike racks come with a pre-existing lock system for your cycle and car. use it as instructed in the manual. In this case, tie down the cable lock through a closed loop on the car and around the rack, and then lock it up. Ensure to use a quality, strong, tight cable lock. The procedure is the same as when using a cable lock, except this time it is a u-lock. These locks are considered to be very secure. Keep the key to yourself. Yes. You can put a rack on the trunk, spare tire, the car roof or truck bed. Where you put it matters depending on your usability; if you use the trunk a lot, consider a rack that will not obstruct you from accessing it, or use a roof rack. Consider how you will drive too. Some racks may limit you on roads to use because they increase the length or height on your car. You begin by reading the instructions manual or watching videos online. After getting a glimpse of what you are supposed to do, collect all tools necessary and install. Note that it is a simple process and you have to attach it tightly to avoid the rack swaying or abrasion with the car. The best bike rack is not the one that looks good, holds many bikes at a go or costs the least to purchase, although these are a plus. The finest one is that which protects your locomotives from scratches, grips your bike firmly and does not inconvenience you from using some parts of your car. With everything that you now know about bike racks, it is a walk in the park shopping for the best one for you. Have it in mind that you are the one who shall use it, so make the most personal choice possible. Use our buying guide in the ordeal, and come out a happy customer.